Sea ice | Wott's Up With That? It has been awhile since I’ve done a sea-ice report. 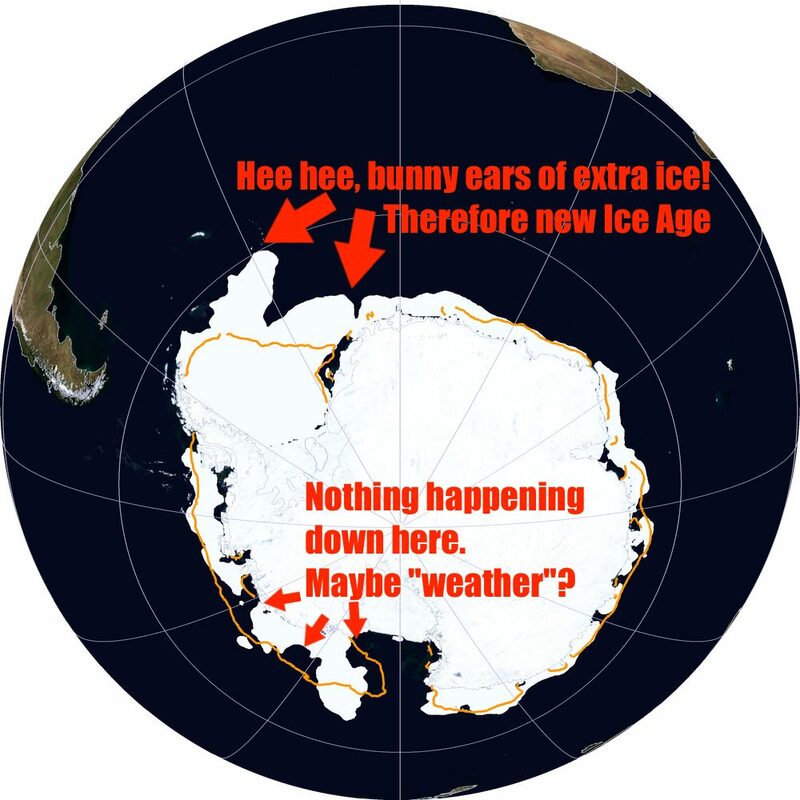 That said, not much of note has been going on in the sea-ice arena, we are in that time of year when all of the years converge into a tighter grouping. Anthony even thought he could bluff his way past his own chart. Nice try. He does try to bury it among a busy collection of eye-glazing squiggles and bar charts. Nothing to see here, says Anthony... My annotations in red. “Cryosat ice mission returns first science data“. Yes, Cryosat, which measures sea-ice thickness using synthetic aperture radar, has started returning usable data. Strangely, Anthony Watts directs his readers to the disgustingly “alarmist” BBC for more information. 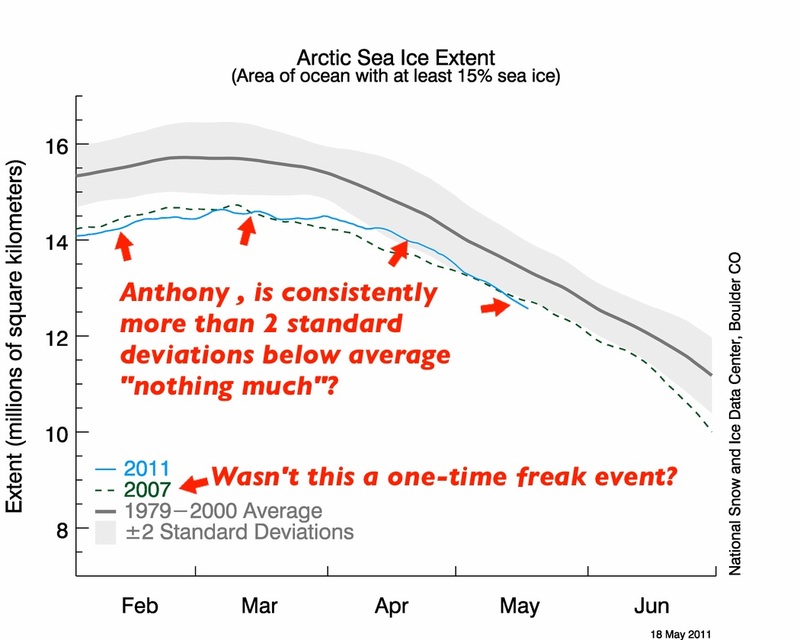 Now I suppose we simply have to wait 30 years for Anthony to begin to accept that the disappearing Arctic Sea Ice is statistically meaningful. After-all, this is “just the first data”! Anthony has the gall to lay the final blame on the NSIDC for not publishing their daily data. Why, because they release data on a weekly basis, an over-eager denialist might jump to a rash conclusion! Eyeballing is the only tactic Anthony’s can use to pretend he has a factual point in the Global Warming discussion, isn’t it? Oh, there’s cherry-picking too. 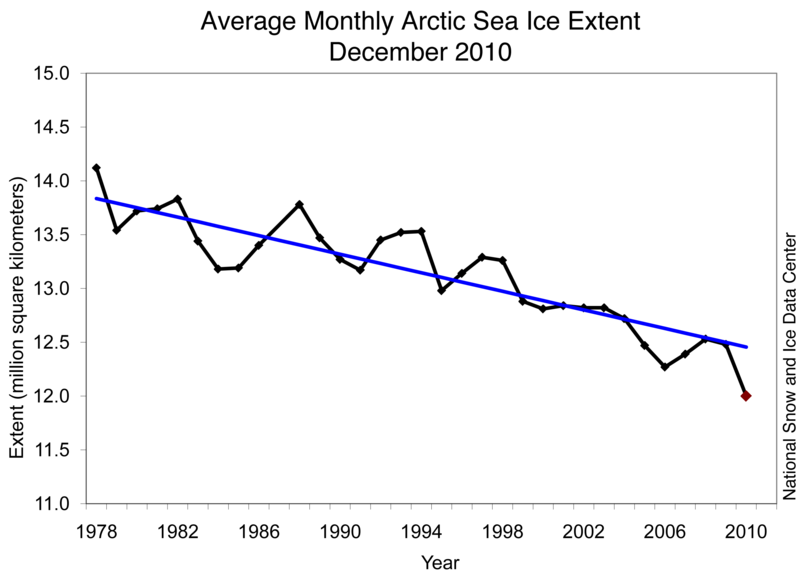 “Joe Bastardi’s 2011 Arctic Sea Ice Prediction“. Joe Bastardi says “the ice is coming back”. But it will be a warm summer too. Whatever.